So you are stuck at home because of another miserable New England snow storm (as I am today). Or maybe you are sitting at work confined to a tiny cubicle feeling like a character in the movie "Office Space." Either way you are probably wishing you could be at Disney World instead. Well now you can.....sort of. With the help of a computer and a fantastic website called WDWLive, you can feel like you are actually at the vacation kingdom. WDWLive is a Walt Disney World video and photograph site. The amazing and unique aspect is the way the videos are captured. These are not typical home movies that move from scene to scene with a tourist narrating the soundtrack. They are perfectly still (obviously on a tripod), giving us a first person perspective of scenes from all over the resort. In addition to the crystal clear HD video, they include the ambient sound of whatever you would hear if you were actually there. The term that WDWLive uses to describe these clips is "atmospheric video." As silly as this may sound, by blocking out your peripheral vision with your hands, you can actually go to Disney World while sitting at your computer! In addition to the great videos that this site provides, there are also a large number of high quality photos to choose from. They are available in both regular and widescreen resolutions. Besides using these pictures as your computer wallpaper, you can also push the "play" tab and the photo becomes a jigsaw puzzle. This could be a fun way to pass the time while waiting for your next coffee break. It sure beats solitaire! The last section of the website that I want to mention is the "Disney World Virtual Web Cam." While there is no longer an actual live web cam at the Magic Kingdom park, this is definitely the next best thing. According to WDWLive, "we offer you dynamic video footage looking down Main Street U.S.A. Depending on the time of day you visit our web cam, the video adjusts itself to (roughly) reflect real daylight conditions. Our unique algorithm also randomizes the video you see within the time block of your visit. In all there are about 300 clips and almost 4 hours of footage." I am watching the virtual web cam right now and it is showing an empty Main Street U.S.A. with only a handful of guests and a couple of security guards visible. This is what you'd expect to see on a January night as we approach midnight. For us true Disney World geeks, this is pretty darn cool! Finally, I have to say that WDWLive does a good job of adding material to the site on a consistent basis so there is always something new to check out. The next time you are sitting near a computer and need a Disney World fix, go over to http://www.wdwlive.com/! One of my favorite Disney World resources is the "DIS" website located at http://www.wdwinfo.com/. The DIS is the largest unofficial on-line guide to Walt Disney World. There are a lot of great Disney World websites on the net, but the DIS is a great "one-stop" shop for quick information on just about everything related to the happiest place on earth. The DIS is set up with the left side of the home page displaying all of the major categories including Disney News, Theme Parks, Resorts, Dining, etc. Several of these topics have sub-categories that allow you to quickly get to the information you are looking for. I'm going to briefly talk about the sections that are specifically related to trip planning. First and foremost is the "Theme Parks" section. This is a great place to get detailed information about every attraction, show, store or restaurant on the entire property. This includes things like ride lengths, height requirements and pictures. Two helpful sub-categories in this section are "Disney Park Hours" and "Disney Park Maps," both of which can be very useful in planning each day of your vacation. The final area under the topic of theme park is the "Rehabs and Closings" sub-category. This is one of the first places I check before booking a Disney World vacation. It is where you can find the dates that certain rides or even an entire water park may be closed for refurbishment. I certainly wouldn't want to book a trip for a time that our favorite attraction, The Haunted Mansion, wasn't going to be open! The second category to look at while planning your Disney World vacation is "Disney Resorts." This area has detailed information on every Disney resort as well as nearby off-property resorts. Here you will find everything from room rates, to room sizes with diagrams, to resort maps. There is a description of each resort that includes great pictures to assist you in choosing your accommodations. The next major category on the DIS is "Disney Dining." This is a place where you can find all you need to know about eating on at Disney World. This is an extremely comprehensive section that includes restaurant reviews, menus and everything there is to know about the Disney Dining Plan. It even addresses special dietary needs, dress codes and tipping guidelines. This is an excellent place to research restaurants before making reservations prior to leaving on your trip. However, it is also a good resource to look up dining information while actually on your vacation via your laptop computer or internet capable cell phone. The final category that is designed to help you plan your next vacation is called "Events." Walt Disney World hosts many annual events throughout the year. Some of the biggest are the Epcot Food and Wine Festival, Star Wars Weekends, and Mickey's Very Merry Christmas Party. This section of the website is useful for two reasons. First, there is detailed information about each event to educate and peak the interest of potential visitors. If one of these events sounds fun to you, it could help you decide when to book your trip. However, if you were planning on specific dates for your vacation and realize there is an event scheduled that you weren't going to attend, you may want to change your plans. Often times the crowds can be pretty thick during major events, especially around the holiday season. There are many other excellent areas of the DIS website that aren't directly related to Disney World trip planning but are certainly worth visiting. There are large sections that are dedicated to the Disney Cruise Line, Disneyland, and the Disney Vacation Club. Finally, I want to mention the section called "Discussion Boards" where Disney fans can communicate with each other. This is a great place to ask a question that you would like answered quickly. There is sure to be someone on the boards that will post a reply to your question in a very short period of time. I will actually be dedicating an entire article on Disney World discussion boards, forums and chat rooms in the near future. One of the greatest things about a Disney World vacation is the food. Some people say that Disney built rides and attractions to pass the time in between meals! The quality is usually exceptional and there is an amazing variety of dining choices. To guarantee a table, many of these restaurants require an "advanced dining reservation" (or ADR). In the past, you'd have to call (407)WDW-DINE to get an ADR. You can still do that, but for approximately two years Disney has been allowing us to make ADRs online at the Disney World website. In many cases this method saves us time, as we don't have to wait on hold to speak to a reservations agent. and is at http://disneyworld.disney.go.com/reservations/dining. The website has several great features. First, you can browse the many dining establishments located throughout the resort. The site can be searched by location, such as the Magic Kingdom, or by cuisine, such as Asian or Italian. Second, there is a brief description of each dining experience, including price ranges for table service restaurants. Finally, and most importantly, the website allows you to make advanced dining reservations up to 180 days in advance. 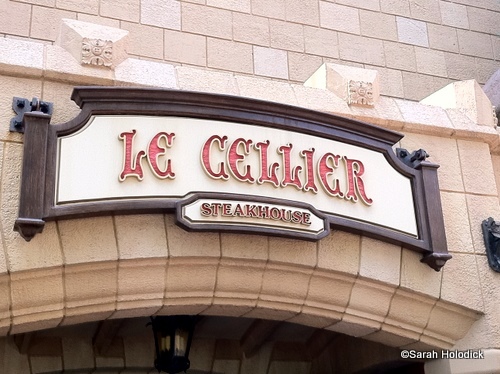 Amazingly enough, you have to get ADRs six months in advance if you want to eat at some of the more popular spots, such as Le Cellier in Epcot's Canada pavilion. Ok, so a website that allows you to make a dining reservation isn't exactly an amazing technological breakthrough. However, only a few months ago, Disney took their online reservation system to the next level. The Disney World dining & reservations website is now formatted for your iPhone or Android mobile device. We now have the ability to quickly make an advanced dining reservation right on our cell phones and I did just that while on our most recent vacation. About half way through the trip, my wife Melissa mentioned that it would be nice if we could eat at the Crystal Palace in the Magic Kingdom. It has become a family favorite. I jumped on my iPhone and in less than two minutes we had a 4:40 reservation for that afternoon! Sure, we could have gone to the restaurant without an ADR and waited an hour for the possibility of a table opening up, but I like the two minute iPhone method much better. In summary, the Disney World dining & reservations website is a helpful tool both in the planning stages of your vacation as well as while you are actually there. I certainly recommend making dining reservations as far in advance as possible, but as a last resort the mobile phone version of the website is a great option. Bon Appetit! I just got back from a great family vacation at Walt Disney World. Although it was only myself, my wife and my little boy actually on the trip, I was able to bring along my parents, sister and brother through the magic of my iPhone 4. Throughout our vacation, I took pictures and short videos with the latest mobile device from Apple. I then emailed them directly from that phone to my family up in cold, snowy Connecticut. They were able to instantly see our little guy's excitement as we toured the parks. In addition to simple pictures, most cell phones can actually take short video clips. However, other than the higher end smart phones, the quality of the video is certainly lacking. The 720p high definition iPhone 4 video camera is an exception. In many cases, the videos I have taken with this phone are of better quality than I get from my standard mini dv camcorder. I was able to email some great fireworks clips from both Illuminations and Wishes to my family back home. It is almost hard to believe that these videos were recorded and emailed from a cell phone! Cameras have been around for a very long time. However, the relatively recent explosion of digital photography has changed the way we capture the memories of our Disney World vacations, at least for me. Now before I go any further, I have to admit that I am somewhat of a photoholic, if there exists such a condition. My wife says that my camera (and often video camera) are my girlfriends. While that may be a slight exaggeration, the simple fact is that I have over 25,000 pictures stored in my computer, all of which were taken since 2002. Why have I taken so many pictures? Two words: digital photography. The truth is that prior to my first digital camera, I wasn't much of a photo buff at all. Film wasn't cheap and the process of developing pictures took too long. You'd have to pay for the film, snap the pics, drop off the film at a photo center and then actually wait for them to be printed. Then, after this lengthy process, you'd have to pay money, once again, to pick them up! Not to mention, you'd only have 24 or maybe 36 pictures in your hand at the end of this lengthy process, many of which were blurry or too dark. Enter......the age of digital photography. There are so many great reasons why digital cameras have enhanced our Disney World photo taking experience. First and foremost, we never have to worry about wasting film. As long as we have enough storage space in the camera we can snap away with reckless abandon. As I write this, we are starting our fourth day at the happiest place on earth, and I have stored 427 pictures so far. I have actually taken well over 500 but have erased many on the fly. The ability to check the quality of the picture, as soon as you take it, is the second amazing thing about digital cameras. If Cinderella's Castle is a little out of focus or my son blinks, I can simply take a second shot and quickly erase the original. Along those same lines, I can immediately crop or resize the picture right on the camera's display. In the past, we'd have to fly home, start the development process described above, only to realize that our little guy blinked! It was almost like playing the lottery and "hoping" that you would get lucky with a handful of good pictures. Finally, I want to mention how easy it is to share your digital photos. First, you simply upload all of those great Disney pictures onto your computer. From there, you could copy them onto CDs and give them to all of your friends and family (whether they want them or not). Or, you could email your best photos to everyone you know. Everybody should have a picture of your kid standing in front of the Magic Kingdom, which is literally the most photographed spot in the world. You could also post your photos on the Internet using a service like Snapfish or Flickr, and then other people can choose what pictures they want to save or print. Although, I can't imagine why anyone wouldn't want ALL of my Disney World pictures. I mean, doesn't everyone need 15 photos of the Tower of Terror queue or every angle of the Tree of Life? Ok, I guess I am just a little obsessed with taking great pictures while on vacation. But like I said at the beginning of this article, I am a photoholic and I'm not sure that there is any recovery in my future! I am currently writing this at 34,000 feet about halfway down the eastern seaboard, on my way to Walt Disney World. A few moments ago I was pondering what my next article was going to be about, and it was literally staring me in the face. I was watching a Travel Channel Disney World special on my iPad and it hit me. I am on an airplane enjoying a great documentary about the vacation kingdom. I would say that this is a pretty good example of modern technology helping me get my Disney World fix! It doesn't seem that long ago that when we wanted to watch something of interest, we'd have to look it up in the TV guide and make sure that we were home at exactly the right time to turn it on. Then we would inevitably get a phone call or mom would put dinner on the table, and we'd miss some or most of our show. Then this great new invention came out called a VCR. We were very lucky to have one of the first, back in the early 80s. Now we could tape a show and have the luxury of watching it at a later time. Of course if you had a computer science degree you could actually "program" the VCR to start recording at a specific time. In my family, I was considered brilliant because I actually got the little digital display to stop blinking 12:00....12:00....12:00. You get the picture! The next great invention, sometime around the millennium, was the DVR or digital video recorder. This amazing box actually allowed you to easily record tv programs without having to use a video tape. I still don't know where it keeps all of these hours of video so I just chalk it up to magic. But, there was still one fundamental problem......you had to be HOME to watch these recordings! This leads me back to row 22, seat F. What has happened over the past decade that allows me to watch whatever I want, whenever I want to watch it, from an airplane? The Apple company went from a second rate computer manufacturer to creating a whole new technological world with their iMacs, iPods, iPhones and their newest marvel, the iPad. Although many other companies now use similar technology, Apple was truly the innovator and the overwhelming industry leader. When we talk of any portable media device we almost always say iPod (Apple's trademark), even if it isn't made by Apple. This is akin to how most of us say Kleenex when referring to any brand of facial tissue. Getting back to my Travel Channel Disney World special, I'd like to quickly describe how I got this video from my home in CT to my lap next to the emergency exit on AirTran flight 1079. First, I stuck the DVD into the side of my iMac and copied it to the computer using a free program called "Handbrake." I then used iTunes to transfer it to my iPad, iPhone and my son's iPod Touch and voila, it is now a show that I can watch anywhere I may be. Incidentally, my son and wife are three rows behind me (not a great job of selecting seats!) and he is watching something Disney related on his iPod. Ok, we are about to land in Orlando. I'm going to try (as hard as it might be) to actually "experience" Walt Disney World World for the next week without staring at a portable device. However, I look forward to watching my home videos on my iPhone and iPad when we get back! As a diehard Disney World fan I am often looking for good video footage of the parks. Earlier this year, I found a website that I feel has the best selection and quality of attraction videos available. The name of the site is Martin's Videos and it is located at http://www.martinsvids.net/. Although I have never met Martin, it is obvious that he is a guy who truly "gets it" when it comes to his passion for Disney parks. He is a Disney fan who decided to use his talents as a videographer and producer to create top notch videos on both current and old attractions. These aren't just home movies. Martin takes the time to make mini-documentaries in most of his productions. His behind the scenes footage and ride track diagrams are amazing. When watching his videos, I often wonder where he finds some of the historical pictures and concept drawings. I am always looking for this type of stuff using typical internet search engines, but I rarely find the kind of material that Martin has gotten his hands on. This guy is very good at doing research and he includes details that you don't see in souvenir type books and videos. I want to comment on the quality of what Martin puts out. Again, these are not your typical shaky, out of focus home videos. Even the clarity of the footage from the 70's is better than what you'd expect from that time period. He currently uses an HD camera that provides us with crystal clear video. In addition to quality, Martin has put out a large quantity of movies. His work is not limited to just Disney World. He includes Disneyland as well as the parks in Tokyo, Paris and Hong Kong. Finally, I want to put in a personal thank you to Martin for what he does for us Disney maniacs. It is hard to believe, but all of Martin's videos are completely free for us to watch. He could certainly charge a good deal of money for these productions, but he simply provides them to us out of his passion for sharing something that he loves. I highly recommend checking out his website and catalog of videos. You won't be disappointed! For those of us in the North, it is fun to check the weather in Central Florida as we dream about being at Disney World, especially this time of year. It is also nice to be be able to quickly check the forecast as a trip to the vacation kingdom approaches. My family is currently in the latter group as we are in the process of packing for our upcoming getaway. In the fairly recent past we'd have to turn on the Weather Channel and wait for the "National" forecast to get an idea of temperatures and storm predictions for the near future. Heck, it doesn't seem like that long ago that I would buy a USA Today newspaper to get the national forecast a few days before a Florida vacation. My parents will tell you that on some of our first trips to Disney World, back in the 70's, we had no idea what to expect other than the general average temperatures found in Steve Birmbaum's Official Guide to Walt Disney World. All of that has changed with the wide availability of internet weather, specifically on our mobile devices. Now we truly have the Disney World weather conditions and forecast available at our finger tips. Even the most basic cell phones now allow you to now pull up the weather in a matter of moments. However, if you have one of today's cutting edge "smart phones," the availability of weather information is almost limitless. As a former pilot, I had become sort of a weather junky. I currently have about six different weather sites bookmarked on my iPhone. My favorites sites for current conditions and forecasts are the weather channel, accuweather, and weather underground. For current radar, I like intellicast. Of course, for smart phone users, there are a number of free "apps" available to access sites like these without having to bookmark a website. So we have another example of how modern technology helps us stay connected to Walt Disney World. Whether we are trying to decide what to pack or want to know if it would be a good idea to grab our yellow Mickey ponchos on a given day, having the weather at our fingertips sure makes it easier. For the rest of the year, it is a lot of fun to see what the weather is like at our favorite vacation spot while we look forward to our next vacation. I know that most of us have heard of and probably used Google Earth by now. It has become the standard for quickly viewing just about any spot on the map using satellite imagery. However, for the past few years, we have been able to do a lot more than that when looking at Walt Disney World in Google Earth. The entire Walt Disney World Resort is now available in 3D! What do I mean by 3D? Ok, so it isn't the 3D that we see at Muppet Vision 3D or It's Tough To Be a Bug or even Captain EO. It is actually computer generated three dimensional models of the the parks and the resorts throughout the property. This program allows us to "zoom in" on a specific spot at WDW and then magically tilt our view so that it looks like we are flying just above or through the different lands of our beloved theme parks. The computer renderings are done very well and the details are phenomenal. My family is preparing for a trip down to Walt Disney World next week. Although we go often, this will be our first time staying at the Beach Club. I have walked by this resort many times while on the walkway around Crescent Lake. I have also seen many pictures of the resort online. However, using Google Earth gave me the best and most realistic views of the entire property. Another great feature of Google Earth's Disney World is the YouTube links that are embedded throughout the property. While "flying around" the Beach Club, I clicked on a YouTube link that took me to a high quality home video of a couple who recorded their stay at this resort. This gave me the opportunity to see views from their balcony as well as a walk through of the lobby. In addition to YouTube links, there are camera icons that, when clicked, show you actual pictures tof that specific location. My blog is all about using modern technology to keep us connected to Walt Disney World. I can't think of a more modern technology than the detailed digital renderings and "first person" views that Google Earth offers. All you have to do is go here to download the current version of Google Earth. After opening the program, simply type "Disney World" in the search box and then click on the mouse ears to view the property in 3D. You can also go to Disney's official website to get a quick tutorial on how to use Google Earth for navigating through the 3D version of Walt Disney World. Just use the search terms Google Earth Disney World in Google. Click the first link and a short video from Disney's site will start automatically. I have to admit that up to a year ago I had never listened to a podcast and really didn't know what they were all about. Now, hardly a day goes by that I don't listen to at least a portion of a podcast specifically related to Walt Disney World. I discovered this fantastic media by accident. Being the Disney World geek that I am, as well as an avid iPhone user, I was browsing iTunes for anything Disney related. I had heard the term podcast in the past, but never really paid any attention to that category in iTunes. That all changed when I saw that there were podcasts specifically dedicated to the subject of Disney World. I quickly downloaded the current episodes of two of these shows and I was hooked. The world of podcasting, much like the world of blogging, is a relatively new phenomena. It has only been widely available to the public for about six years. For those of you who aren't familiar, a podcast is basically a radio show that is recorded and then made available for download via the internet. These shows can be of any length and are available on literally thousands of topics. Typically the listener will put episodes of their favorite podcasts on their iPod or iPhone and listen to them at their convenience. This is similar to recording your favorite TV shows and watching them later on a DVR, TiVo, or (for those of us over 30 who still know what a VCR is) a video tape. You can also listen to podcasts directly on your computer if you don't own the latest Apple portable device. The first Disney World podcast I found was WDW Radio hosted by Lou Mongello. Lou is also the author of the Walt Disney World Trivia Books and a fellow Disney World geek. He has a tremendous passion for what he does and obviously puts a lot of work into producing his weekly podcast. Lou is also a well respected leader in the Disney online community and does a great deal of work for charity, specifically in raising money to send seriously ill children to Disney World. In listening to the WDW Radio show each week, you are transported to Disney World via your iPod and it really helps you stay connected to the "World" in between vacations. Lou does an amazing job at highlighting the history and details of different attractions, restaurants and resorts. He also interviews Disney legends, cast members and historians on a regular basis. Each of his shows are typically well over an hour long and are entertaining and informative from beginning to end. Lou has just recorded his 200th show and was recently honored by winning "best travel podcast" by the "Peoples Choice Podcast Awards." For more information about Lou and WDW Radio you can visit wdwradio.com. The other Disney World podcast that I currently listen to is called Inside the Magic hosted by Ricky Brigante. Ricky's show has the distinction of being the first Disney World podcast hosted from the Orlando area. His weekly show has been going for five years strong and he has just recorded his 300th show. Ricky does a great job of bringing us the current Disney and Orlando theme park news. He also attends and keeps us abreast of annual events as well as attraction and restaurant openings. Like Lou Mongello, Ricky is very passionate about what he does and his enthusiasm is apparent in each of his shows. For more information about Ricky and Inside the Magic you can visit insidethemagic.net. One of the best things about these podcasts is that each and every show is still available for download. That is over 500 episodes between WDW Radio and Inside the Magic combined! Even though many of these shows are several years old, a good majority of the topics are still relevent today. I have a half hour commute to work and I listen to a portion of one of these shows on a daily basis. I have several years of material at my disposal and I am going through the old podcasts one by one. It makes the drive go by fast and also helps me stay connected to my favorite place while I dream of my next Disney World vacation. I couldn't think of a better way to kick off Digital Disney World than with a discussion about the modern technology of podcasting. I wanted to finish off my first blog post with a quick thank you to both Lou Mongello and Ricky Brigante. My comments regarding their podcasts are unsolicited and I have no affiliation with either of them. However, it is through listening to their shows that I have gotten the inspiration to start my blog. They are definitely the best at what they do!